Pine Island does not have any gulf beaches. We are an interior island that is surrounded by Barrier Islands, which are where the pretty gulf beaches are. 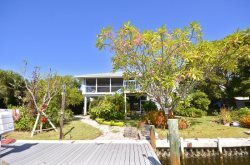 Pine Island is mere minutes by boat from all of the beautiful surrounding gulf beaches of Cayo Costa, Boca Grande, North Captiva, Captiva, Sanibel, and Ft Myers Beach. By car you can reach all of the above mentioned islands with the exception of Cayo Costa and North Captiva. Those islands can only be reached by boat. If you don’t have a boat of your own, don’t worry. You can take the Island Girl Water Taxi, or the Tropic Star Ferry. We do have two properties, the Sea and the Sun cottages, that sit directly on Charlotte Harbor and offer Charlotte Harbor beach frontage. Boat Rentals and Fishing Charters? Pine Island is a boating destination so there are many full service marinas that offer boat rentals and guide services.Monroe Canal Marina offers boat rentals in St James City and Four Winds Marina offers boat rentals in Bokeelia. There are many fishing guides on the island as well. It’s always a good idea to hire a guide to show you around the waters of Pine Island Sound if you have never been here before. We have some shallow waters that can be hazardous if you are unfamiliar with them. We recommend SaltyboyFishing Charters with Captain Scotty Darna and Snook Town Charters with Capt Joe Harley, who specializes in fly fishing the sea grass flats of Pine Island Sound. We also recommend Captain Charles Epranian and Captain Shane Dooley. It is always a good idea to make boat rental reservations and guide trip reservations well in advance. We have one grocery store on the island. The Winn-Dixie is located at the island center and is open every day with the exception of Christmas. There is also a Publix grocery store nearby, it is just off island at the intersection of Burnt Store Rd and Pine Island Rd. The island also has a few produce stands that offer a wide variety of local fruit and produce. There are also lots of boutique shops and art galleries in Matlacha which are a fun way to spend the day. Pine Island has a wide variety of restaurants and bars. If you are looking for a gourmet meal with a beautiful sunset view try the Tarpon Lodge. Rather hear a great band play and enjoy a burger? If so, try Berts Bar in Matlacha. There are over 20 restaurants and bars in the Greater Pine Island Area, plenty of variety to please everyone. Do your properties have internet? All of our properties offer wifi for your convenience. Greater Pine Island has over 10 churches between all of our communities. There is something for everyone on the spiritual side of things. There are 4 banks on the island. Can we swim in the winter? Pine Island usually enjoys very mild winters, however that isn’t always the case. The average gulf water temperatures in the winter range between 68 & 73 degrees.